Today is reveal day for my Facebook Art quilt group Art Quilts Around The World. There are 20 artists literally from all over the world and I have met none of them. The group has had a huge change in membership and the current group of 20 people seem to be excited about producing a small challenge quilt every other month which was not the case in the past. This challenge is Steampunk which isn't really a challenge since it is one of my favorite things! I have a Pinterest board devoted to steampunk fashions. I already made a larger more detailed steampunk quilt which is at the bottom of this post in which I used a variety of lames. velvets, gears and repurposed jewelry. This quilt has been entered in various quilt shows and has won a few awards. I decided to use the same turquoise and orange color scheme as the first quilt but simplify it. No garment or hat due to size restrictions. I chose to have a variety of gears in a variety of colors, textures and fabrics as the portrait hair. I call it "Gear Head!" I Googled clip art of gears to get the different shapes and sizes of gears and just started placing and fusing. This is the close up of the face. Again I used Cherrywood Hand Dyed Fabrics for the skin tones because I love them! I used the same turquoise lame on the eye lids as in the gears. I found a hand dyed brown velvet for the lips. When one sews garments with velvet the nap of the velvet must go in the same direction or it looks like different shades. 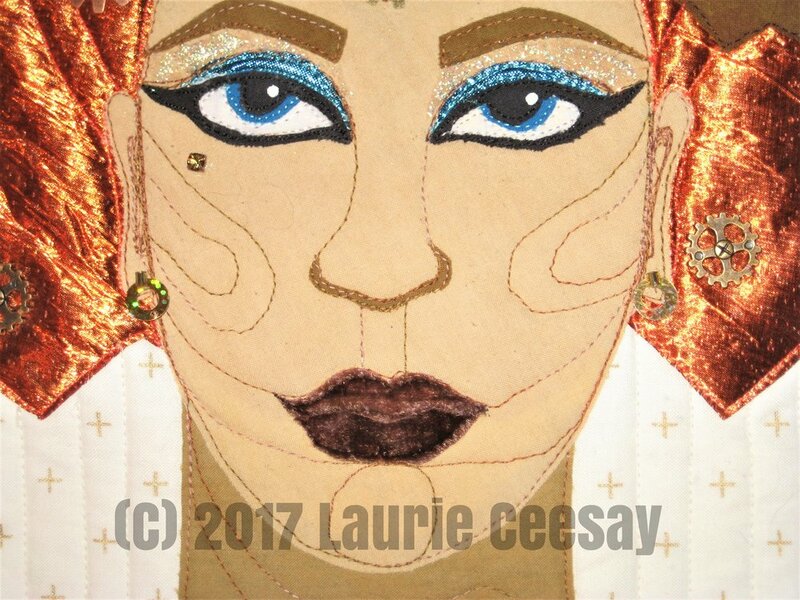 I purposely placed the upper and lower lip applique pieces in the opposite direction to look like two different fabrics. I used two glitter nail polishes in the eye area. Since there wasn't room for a garment I Pinterest searched steampunk clothing again to see what I could add to the neck area and found a ruffled choker necklace. I used a taffeta olive green for the base and some old fashioned looking trim which I hand gathered and a repurposed button from my stash. Success! The background fabric was selected because it looked simple with a hint of gold and it also appeared old fashioned. I used two lames, a leather-like lame, gold embossed fabrics and rusty looking brown for the gear fabrics. I purchases metal gears from two different stores and hand sewed them sporadically to the quilt. 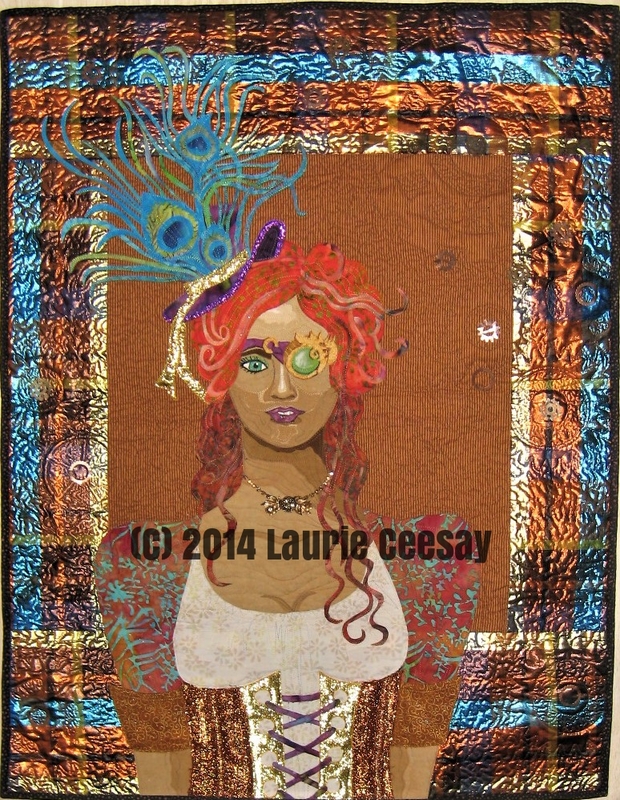 This is my original steampunk quilt which is featured on the PBS TV show "Treasured Quilts of Wisconsin." It is one of my favorite quilts!